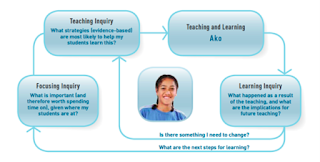 When I first thought of this learning cycle, I had a difficult time packaging it all together. However, looking back through my blog posts and reflecting on the pathway that my students and I have embarked upon this year I have to take a deep breathe and nod my head at the difference it has made in my own teaching. Strategically remembering to take time out to develop a love for language and language development through reading (using many of Dr. van Hees’ techniques and a few of my own) has made a world of difference for my students. I have thoroughly enjoyed all of the Professional Development we have received as a CoL team this year. Whenever I listen to Dr. van Hees, I gain so much knowledge and sequentially grow as a teacher so much in my understanding of how to provide a pathway for vocabulary acquisition through dialogic conversations. I have also become more aware of using rich vocabulary in all of my interactions with my students and in what we provide as visual aids around the classroom and on our site. The CoL Professional Development from the Woolf Fisher Team has pushed me to become more aware of what is necessary to further my own professional learning through inquiry and how to present my inquiry at a higher standard. Most of all, I have enjoyed being able to share my inquiry with others. Whether it be during our CoL meetings, PES Inquiry meetings (twice a term), presenting at the Manaiakalani Hui or conversations in the staff room, I find that I always gain perspective from the insight of others. Iron sharpens iron when you have professional conversations about your teaching practice with others in the field of education and I feel that I learn so much from these conversations...even if I sometimes have to remind myself to take a step back and not take offence when suggestions are made for improvements, which often provide motivation to reflect upon my inquiry at a deeper level to see where change is being effective and where it might need to be adjusted, scraped or turned completely around. I can no longer go back to teaching without conducting an Professional Inquiry at anything less than the level we were pushed to achieve this year. I can only hope that I have done the process justice. However, I know that I have grown greatly as a teacher and as a result my students have flourished as well.